Another Concert Review update: Toundra and La Red Bullet live in Pamplona, 5 April! A Concert Review of Arena live at the Manchester Academy, 3 April! CD & DVD Reviews, Issue 2019-029: Jon Anderson - 1000 Hands Chapter One, Avandra - Descender, Tim Burness - Interconnected, Hackberry - Hackberry, Si Hayden - Guitar Tree Hill, and Heartscore - Black Riders Part 1. CD & DVD Reviews, Issue 2019-012: Agusa - Ekstasis - Live In Rome, Coma Rossi - Coma Rossi, Garrett N - Let's Get Surreal, Svarc Hanley Longhawn - SHL#2, and Syndone - Mysoginia. CD & DVD Reviews, Issue 2019-011: Dream Theater - Distance Over Time, Colin Edwin and Lorenzo Feliciati - Twinscapes Vol 2: A Modern Approach To The Dancefloor, Focus - Focus 11, Rikard Sjöblom’s Gungfly - Friendship, Walfad - Colloids, and The Wrong Object - Zappa Jawaka. CD & DVD Reviews, Issue 2019-010: Ecovillage - Sacred World, Lapis Lazuli - Brain, LizZard - Shift, Maat Lander - Seasons Of Space - Book #2, and Shadow Matter - Shadow Matter. SFTW #195: It's Back! After a long holiday, Something For The Weekend has a whole new look. Check-out our first edition of 2019: Five progressive discs you needed to spin in January : Mad Fellaz, Slug Comparison, In Continuum, Althea & PreHistoric Animals. CD & DVD Reviews, Issue 2019-009: Marc Durkee - Remain In Stasis, Nemo - Presagés 2018, Nosound - Allow Yourself, and Scolari/Cavalca - Natural Impulse. 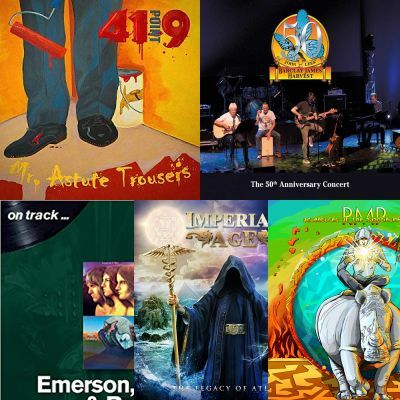 Prog Central - Progressive Rock: Our new Spotify Playlist for those who enjoy the more traditional style of progressive rock has had a mega New Year makeover. 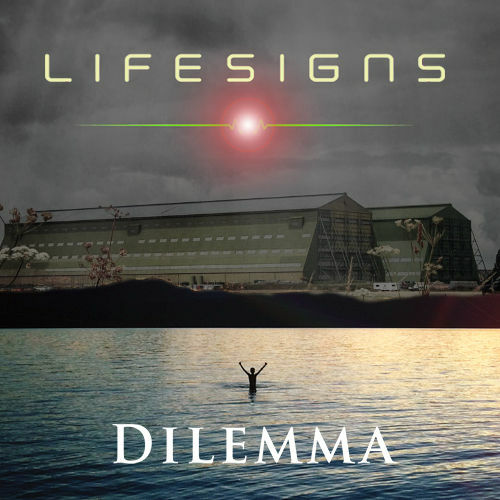 Discover 20 new (ish) albums from the likes of Steve Hackett, Tim Bowness, RPWL, In Continuum, Slug Comparison, Alberto Rigoni & Marco Minneman, The Last Detail, Autumn, Residuos Mentales, Althea, Mad Fellaz and Steven Wilson (live). Listen here.. Each of our playlists will be updated with fresh tracks every month. CD & DVD Reviews, Issue 2019-008: Echoes of Giants - The Way To Us, Grand Reunion - In The Station, Hats Off Gentlemen It's Adequate - Out Of Mind, Magenta - We Are Seven, Magenta - We Are Seven, and El Tubo Elástico - Impala. We're very happy to announce the revival of our Forgotten Sons series! Serge Wemmenhove wrote an article about Dutch prog band Het Pandorra Ensemble! Prog Central - Progressive Metal: Our new Spotify Playlist dealing with the heavier side of prog has had a January make-over. 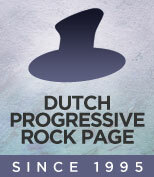 Listen to 20 slabs of prog-metal including new releases from: O.R.K., Dream Theater, Autumn, Queensryche, Darkwater, Soen, Evergrey, PreHistoric Animals, Shattered Skies, Dimension Eleven and Silent Clash. Listen here..
CD & DVD Reviews, Issue 2019-007: Chandelier InterReview: an interview plus reviews of the latest re-issues of Pure and Facing Gravity. CD & DVD Reviews, Issue 2019-006: Karma Rassa - Vesna... Snova Vesna, Lucas Lee - Lowered Expectations, Mark Nauseef - Personal Note, Nauticus - Disappear In Blue, and Steve Pilkington - On Track... Deep Purple & Rainbow - Every Album, Every Song: 1968-1979. CD & DVD Reviews, Issue 2019-005: Steve Hackett InterReview! An interview with the man himself and a Round Table Review of his latest album, At The Edge Of Light. CD & DVD Reviews, Issue 2019-004: Anti Clock Tower - Tic Toc Turmoil, The CSides Project - 10 Days, Texel - Zooming Into Focus, Thumpermonkey - Make Me Young, Etc, and World Service Project - Serve. CD & DVD Reviews, Issue 2019-003: a Duo Review of Vasil Hadžimanov Band - Lines In Sand. CD & DVD Reviews, Issue 2019-002: Bordelophone - Bordelophone, David Cross and Andrew Booker - Ends Meeting, Old Rock City Orchestra - The Magic Park Of Dark Roses, Sanguine Hum - Now We Have Power, Det Skandaløse Orkester - Tenk om noen ser deg, and Velcrocranes - Afterlife. CD & DVD Reviews, Issue 2019-001: Light Damage - Numbers, Pymlico - Nightscape, ScienceNV - The Quest For Prester John Volumes 1 and 2, and Vespero - Hollow Moon. Special features: Do not miss our four-part round-up of the best music from 2018. Part 1 was the The Best Progressive Rock Albums of 2018. Part 2 was The DPRP Writers Top Progressive Rock Albums of 2018. Part 3 was the Top 20 heavy prog and progressive metal albums of 2018 and Part 4 was the list of 13 Amazing Progressive Rock Albums you may have missed in 2018 Happy listening! CD & DVD Reviews, Issue 2018-090: Atlas: Empire - The Stratosphere Beneath Our Feet, Anneke van Giersbergen - Symphonized, Maidman - Dreamland, Metalwings - For All Beyond, Octavarium - Out Of Time, Octavarium - Dystopia, Trigon - 30 Jahre Traumzeit, Dean Watson - Track Of Days, and Andrew Wild - Queen On Track - Every Album, Every Song. SFTW: Our final special feature of the year sees us look back at some of the albums you may have missed in 2018. CD & DVD Reviews, Issue 2018-089, Mini Reviews Special: Martin Barre - Roads Less Travelled, Cytrus - Trzecia łza od słońca, DC Sound Collective - Dirae Pax, Hillward - System Live, Ljungblut - Villa Carlotta 5959, Napier's Bones - Monuments, Oakhaart - Parallel To An Endless Dream, Tusmørke - Osloborgerlig Tusmørke: Vardøger og Utburder vol 1, and Zan Zone - It's Only Natural. CD & DVD Reviews, Issue 2018-088: Art Against Agony - Shiva Appreciation Society, Kaoll - Ten Years Barbecue, Karmamoi - The Day Is Done, Eddie Mulder - Waves, a Duo Review of Various artists - A Life In Yes - The Chris Squire Tribute, Various artists - Yesterday And Today - A 50th Anniversary Tribute to YES, Vikings - Far Beyond My Dream, Volvox - Universo Expandido, and Watershape - Perceptions. CD & DVD Reviews, Issue 2018-087: Anima Mundi - Insomnia, Gorod - Æthra, London Underground - Four, Yesterdays - Senki Madara, and Yurt - IV - The Obstacle Is Everything. CD & DVD Reviews, Issue 2018-086: Circadian Pulse - Elements Of Existence, Gryphon - Reinvention, IQ - Ever 25th Anniversary, Tim Morse - III, and Sonar (w. David Torn) - Live At Moods. CD & DVD Reviews, Issue 2018-085 another Mini Reviews Special with Bad As - Midnight Curse, Fractal Cypher - Prelude To An Impending Outcome, Gaia - Aerial, Jann Klose - In Tandem, Lathe Of Heaven - Now There's No Room, Alec K. Redfearn And The Eyesores - The Opposites, Salva - Off The Deep End, and T3tra - Portals. DPRP Spotify Playlist: The final update of 2018. Listen to the playlist here.